So What’s With All the Hearts? 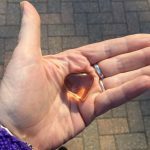 When you unexpectedly hand a complete stranger a heart-shaped piece of glass, they usually have questions. I began giving hearts to random people to remind myself that I’m worthy of giving and receiving the small kindnesses that even the most jaded human beings are capable of. I’d been led to believe otherwise since childhood. I’m about to share a little too much here so bear with me: for as long as I can remember I was taught that everyone else’s needs and feelings were more important than mine. What’s more, if someone was angry or unhappy it was probably my fault. If your Thanksgiving in 1978 sucked, that was my fault. Sorry about that. I grew up to be a people pleaser, constantly setting myself on fire to keep others warm while secretly despairing and even resenting that no one ever reciprocated, no one put my needs first. My conclusion was that I wasn’t deemed worthy. I learned to self-efface so well that I had no room for self-esteem. I became a human doormat. Some therapy and assertiveness training in my 20s gave me just enough self-confidence to navigate adulthood with a measure of success and independence. Yet I actively avoided eye contact with most people and flinched with guilt at the sound of any voice raised in anger. Medical visits always found me on the verge of tears because I didn’t think I deserved to take up the doctor’s valuable time. So when the opportunity came up in 2014 to attend an experiential self-empowerment workshop, I grabbed it. At the workshop, facilitators helped me confront my shame. At first I felt like I did at the doctor’s: I didn’t deserve their time and attention. They shut that down pretty quickly with unconditional support and for the first time in my life I looked into a mirror and recognized a member of the human race looking back at me. In that moment I knew I belonged. I was worthy. But to my surprise, after witnessing other participants confront their own issues I felt something more. Something I hadn’t counted on. I had gone to the workshop to reclaim my self-esteem but I came away with something greater: compassion. Not only was I worthy of receiving human kindness, I was worthy of bestowing it – as an equal, not as a doormat. “Life-changing” is a phrase I don’t throw around often yet there’s no more accurate way to describe this revelation. While I was still basking in post-workshop afterglow, I was inspired by a blog post to challenge myself to give one small glass heart per day to a total stranger. This would remind me to drop my shield, to be present in the moment, to make eye contact with and open my heart to my fellow humans. I ordered 2 dozen 1-inch glass hearts on Amazon in several colors. My eagerness to get started was matched only by my terror. Two weeks after my breakthrough workshop, I had to go out of town overnight. This seemed like a good time and place to begin my quest. I packed a handful of newly purchased hearts in my bag. The first recipient was the hotel clerk who had given me a sympathetic glance as I waited patiently to check in behind the elderly couple she was patiently dealing with. My inner doormat expected nothing more than a shrugged thanks from her. The reality stunned me. “I’m going to put this on my mantel, right next to the urn with my baby’s ashes!” We hugged over the counter, both of us smiling and crying at the same time. I don’t think my feet touched the ground as I walked to my room. The next morning at breakfast heart #2 went to a man sitting next to me at the diner’s counter. I worried that he’d misinterpret my intentions, that he’d think I was hitting on him, but something in his smile told me he understood it was from the heart but not a romantic overture. He grabbed a paper napkin from the dispenser and carefully wrapped the heart in it before putting it gently into his pocket. We clinked coffee mugs and smilingly parted ways. I felt guilty for feeling so good. The guilty pleasure continues: I’ve become a middle-aged flower child, spreading love throughout the world, one heart at a time. To date I’ve given out probably over 500 hearts from the stash I keep in my purse, at my desk at work, and in my car. Many have gone to family and friends, with specific mention of something I admire about them or why I’m grateful to have them in my life. I once gave a heart to a coworker I’d had a falling out with a few years earlier. That heart returned our chilly détente to the warm friendliness we’d once shared. Pretty powerful for a piece of cheap Chinese glass. That said, most hearts go to strangers. Intuition decides who gets one, chance determines the color they get. It may be to reward a small kindness such as holding a door open for me or for something completely off the wall, like when I gave a heart to a guy sitting next to me on a New York subway car because he had freckly arms like me. Freckle Bro was amused by this reason and we bumped freckly fists when I got off at my stop. Sometimes I have to chase heart recipients down saying “Wait a minute! I want to give you something.” No one’s ever failed to stop and wait for me to fish a heart for them from my pocket or purse. Like the motel clerk, many people tell me just a few seconds after getting a heart exactly where they plan to keep it. On their mantel, at their desk, on their dresser, in their pocket as a good luck charm. My own mantel holds a collection of hearts I’ve received in kind: A large red glass heart from my boss, a heart-shaped piece of driftwood from an old college classmate, and an amethyst heart a now former boyfriend brought back for me when he visited Sedona, AZ. Each of these is larger than the hearts I give out. Literally and figuratively. Not bad for a former self-effacing doormat, eh? I even managed to reverse history by bringing a physician’s assistant to tears. I gave him a heart for greeting me warmly as he walked into the exam room. He told me he’d been feeling very depressed that morning and that the heart made his day. We shared a warm hug. I don’t give out hearts just for the hugs but it’s a lovely reward. The biggest reward is that look of questioning wonder. Because, fellow human, we’re all connected. At the heart. I love this! Thank you for sharing. I am so glad you’re writing a blog. You are hilarious, special, and unfailingly interesting. I am glad to know you!